While as a home or business owner, you will most likely not be installing a PVC roofing membrane yourself, it is important to have basic understanding of the installation process, so that you can ensure that your contractor is doing a good job. As with any roofing material, ensuring that your PVC membrane is properly installed is a key determinant of the longevity and proper service of the roof. Many PVC roofing membranes that fail prematurely, do so because of initial incorrect installation done by an unprofessional roofer, rather than inherent flaws of the roof itself. Prior to installing the PVC roofing membrane itself, typically some type of insulation board is put in. Most commonly used insulation is ISO or EPS foam board. Both of these insulation boards carry an R-value that ranges from 4-R to 6-R per 1 inch of insulation thickness. Insulation is important because it saves energy by reducing heat loss. Heat gain is taken care of by PVC’s cool white surface. A PVC roofing membrane can be installed in three different ways. Regardless of what installation procedure is chosen, all PVC roofing systems are sealed with a hot-air welder. This ensures superior seam strength and makes the membrane resistant to leaks and wind blow-off. When choosing a time to install your PVC roof, note that the temperature of the heat welding of the seams is critical to getting a strong bond. Therefore, welder temperature should be adjusted upwards in the winter to account cooler ambient temperatures. 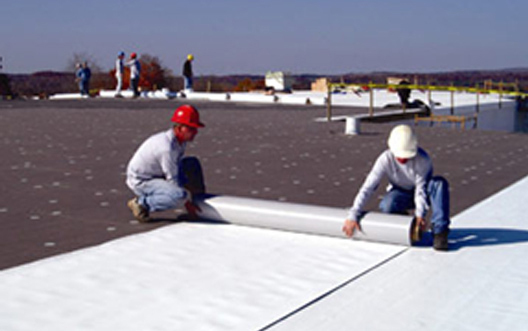 The hot-air welding of all seams and flashing is used on all PVC roof installations. Hot – air welding makes material overlaps last a lot longer, than those on EPDM rubber roofs and other torch applied or glued flat roof systems. The advantage of hot-air welding is that it can be done in the winter and does not require and adhesives to work, where as solvent based glue used in Rubber Roof installation will freeze, making installation or repair impossible. In a nutshell, a PVC membrane is attached to the substrate using a special adhesive. Even though this is a quick and simple installation method, it has one major disadvantage. In case condensation forms underneath a PVC membrane, which sometimes happens as a result of poor ventilation of the roof deck, it will cause the adhesive holding the membrane in place to become loose. As a result, the loose membrane will be susceptible to wind blow-off. While the chance of such strong wind may be very small, the consequences of your roof being blown-off will be disastrous to your property and will cost thousands of dollars to repair. Thus, you need to evaluate whether you want to take even this minimal chance by choosing a full-adhered method of installation. A fully – adhered method of installation is recommended in case your PVC membrane cannot be easily attached using screws or other types of fasteners, such as over a structural concrete deck. In this case, it is best to first attach the insulation with adhesive and then to attach the membrane to the insulation with adhesive to minimize damage to the roof deck. A fully-adhered membrane must always be mechanically along the perimeter, which greatly improves wind uplift. Fully adhering your PVC roofing membrane will also eliminate the flutter that can occur in a mechanically – attached system. NOTE – fully adhered installation method should only be used when the ambient temperature is above 40 F degrees, otherwise the adhesive will freeze, and membrane will not bond properly to the substrate, causing bubbles and delamination problems. Another possibility is to mechanically attach your PVC roof to the substrate using heavy duty screws and barbed plates, which will hold the membrane down tight. This type of installation ensures that even hurricane-level wind will not tear off your roof. If your building is located in a high-wind area, such as along the coast line or on a high hill, it is best to go for mechanically-attached installation. can pvc roofs be installed over torchdown roof? Yes, you can install PVC over torch-down / tar roofing. You best option is to use fleeceback PVC or a separation sheet. You do neet to separate the PVC and any asphalt / tar based material, but this is a fairly simple and inexpensive process and is done all the time. Hello! I work with Berkeley Lab’s Heat Island Group, which specializes in cool roof research. We’re contributing some online content for CoolCalifornia.org and would like permission to use your photo of PVC roofing installation for the site. Please let me know if we can do so, thank you! Hello, my name is Petr Bodecek and I am managing director of company producing plastic coated sheets and profiles for roofing systems, swimming pools…this sheets is possible welded with foils. We cooperate with SIKA, PROTAN, ICOPAL in middle Europe. Please, what foils (producers ) is used in this videos? Can a PVC roof be installed directly on top of a plywood deck? Many low slope roofs we come across have an attic with insulation and do not require insulation on the roof deck. I’ve heard that PVC and TPO roofs will condensate, so I am wondering what should be done when insulation on the roof deck is not needed. Will fan fold or a product like dens deck be sufficient? Can a PVC roof be installed directly on top of a plywood deck? Will fan fold or a product like dens deck be sufficient? I recently had three flat roofs installed. It was not fully adhered as there are air pockets visible underneath . Iwas not here when this installation was installed so I do not have pictures of the installation process. The pvc “floor” seems to give a lot. It was installed in a shallow valley where they (my contractor) said it was not possible to put normal asphalt shingles. The easiest thing would be for me to attach pictures which I will try to do. Well I guess I can’t do that. In short, described as best I can. The roofer installed a slightly sloping PVC roof. When I stand on the roof it gives, so it is not a firm surface. It is not fully adhere so it must be mechanically adhered, but I see no evidence of screws or metal plates. At the top of the valley and at other seams the under boards whatever they are give by about a 1/4 inch or so. Is this normal? I guess I should just call a contractor who specializes in the this type of installation. Screws and plates are under seams / overlaps. I don’t exactly know what “gives” … maybe your substrate rafters are too far apart and you feel the bounce when step on it. All of the flat roofs are in valleys. The triangular shape has the smallest angle at the peak and makes a isosceles triangle at the gutter line. The specific give I am recalling is at the peak area just a few inches down; say 5″; I step there and it pushes the underlay net down about an 1/2-1inch. As I said a picture would make it easier to understand. It is like that in multiple locations. I thought the structure would be more firm than it is. I will be needing to get on the roof a couple times a year to blow leaves off. I don’t want to do any damage to the roof as my hope is it will last for the rest of my lifetime, so to speak. I also want to make sure I got a reasonable job quality wise. I was sort of talked into the flat roof. I also live in Oregon where there is ton of rain in the winter months. Thanks for your response. My contractor will be using an 80 mil white pvc membrane with mesh reinforcement on my flat roof house. The contractor did not remove the existing foam on my roof. They put 1/4 inch thick fiberboard on top of the foam and mechanically fasten with screws to the wooden deck and then put the pvc on top of fiberboard under layment and mechanically fasten to the fiberboard and deck. All the PVC overlap will be welded by hot air. Is this a good practice installation or should I have them remove the foam? The contractor told me the foam is a good insulation during winter and the PVC is heat resistant during summer. Also, since there is no evidence of dry rot underneath the deck, removing the foam is not recommended and will cost me more money on labor. They will also be putting vents on the PVC to control moisture from condensation. Insulation is VERY expensive, and if you can save some money on it, go for it! Mechanically fastened roof is my preferred method, because glue-down is pretty expensive (about $40 per square extra just for glue). Bottom line – your roofer seems to be approaching this correctly, and I’d do, and have done the same thing. PVC is very good over-time. Even very old PVC roofs are easily repairable if needed. The only not-so-good that I’ve seen is 45 or 50 mil Durolast that got very stiff, and was more prone to puncture. That was after 15 year, at the end of warranty. It was still very much a good roof, but roofers made holes in it, with ice breakers. I also heard from contractors, that Flex PVC may not be so good, but at the same time I heard the opposite… Who is your manufacturer? What is a separation sheet and where can it be purchased? If I use fleece back what would be the process to affix PVC to roof? I would like to put PVC over a torched down roof. Thanks for the inputs. They put 1/4″ thick dense deck not fiber board and then laid IB pvc membrane on top of the dense deck. They finished the project almost a month for the entire pvc and metal roofing. So much of detailing work and fixup of rotten wood frames on the roof. I am happy with their work and they know what they were doing. It is very expensive project. If I move I will buy a pitched roof house. It usually take 3 days to replace an asphalt shingle and can last almosy 20 years as well. 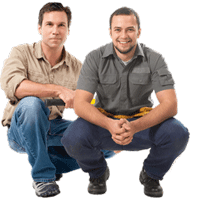 Why is your roofing contractor? I have a new house construction in Berkeley, CA with flat roof. Could you give me his name and phone #?